My mom was up today and as part of her visit we made the obligate trip down to the lake. My trips to the water have been more sporadic lately as the weather cools, particularly during rainy periods, which it has been lately. The few trips I have made have been to the boat, and then across the lake. So I hadn’t been paying too much attention to the vegetation and goings-on in the immediate vicinity of the dock. My mom pointed out some leaves, fallen from the huge tree on the shore, which had a gall at the base of the stem. I believe the tree is an Eastern Cottonwood, towering probably close to 100 feet, with a thick trunk several feet around. The galls, after looking them up, I believe are the result of the Poplar Petiolegall Aphid (Pemphigus populitransversus). This aphid has a complicated, two-part life cycle. The first stage starts with the female aphid, sometime just as the leaves are beginning to grow, burrowing into the leaf petiole (the stem), right at the base of the leaf itself. This intrusion causes the tree to form a gall around the wound in an effort to contain the attacker. The gall is hollow, and inside she lays eggs which have developed into winged adults by summer. Around July here in Ontario, these new adults leave the galls and fly out in search of plants in the Brassicaceae family, which includes commercial vegetables such as cabbage, cauliflower, beets, turnip, radish, and others. These adults burrow into the soil and feed on the roots of the plants, but only cause serious commercial problems when the vegetables are planted late such that the roots are young when the aphids discover them (thereby stunting the growth). Well-developed plants are not bothered much. They reproduce parthenogenically – meaning the females create clones of themselves without mating. The aphids spend the winter buried up to 20 cm (8 inches) deep (according to two sources; one says they return to the tree to lay eggs). Winged adults are produced either in late autumn or in the spring (it’s not clear with the two sources, but the one that has them returning to the tree in the fall obviously requires winged adults in the fall), which return in spring (or the fall, in the case of that one source) to the poplars and lay eggs in the crevices of the bark. These eggs grow into more reproducing individuals, but in this case the female lays only a single egg on the stem of a leaf, which becomes the aphid that burrows into the petiole and starts the cycle all over again. Something like that, anyway. It seems that the life cycle of this species is still a little fuzzy. 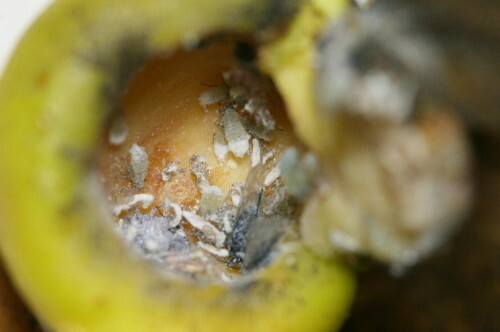 These aphids inside the galls seem out of place based on what I’ve read. Are they just late summer aphids that never made the trip to their winter roots? Or that got started late and plan to head out soon? There were some winged individuals in the galls. Or do some spend the winter in the leaf gall instead of the soil? Maybe some adults return there? The gall, rather than having an open hole, had a sort of cap formed from a folding-over of the petiole, that would keep it snug. My web sources don’t say, so perhaps it will remain a mystery. Hmm… Mysterious. 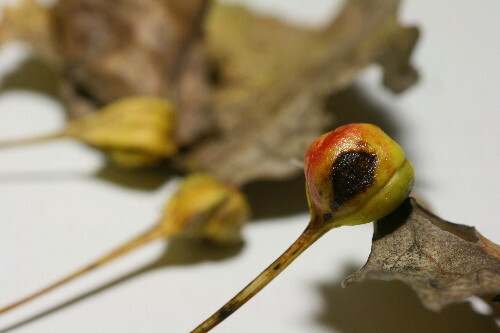 My 3rd grade classes found a gall on an oak leaf – a little one, and became very curious about galls in general… I think I’m going to make a whole unit on galls for them. I’ll have to keep my eye open for this one!